Beach Report Card Most of the best BRC stories aren’t mine, but I have a few. I remember sitting down with my first staff hire, Roger Gorke – now with the EPA office of water in D.C. — to create the first report card. It was an annual study and only included Santa Monica Bay beaches. The early report cards often resulted in irate calls from electeds that somehow blamed us for their poor water quality. We had many press conferences with Dr. Aliza (Lifshitz) providing a medical perspective and talking to the Spanish language media. One year, she had to carry the whole press event at Cabrillo Beach because I literally had no voice! James Alamillo and Mike Grimmer have taken the BRC through many incarnations, but the efforts of former Microsoft exec Jeff Littrell and former staffer Tom Fleming in making the leap to a statewide report card on the website was huge! Amy Smart has come through as a spokesperson for the Beach Report Card, Annual Dinner, Day Without a Bag and Coastal Cleanup Day. I’m so glad Heal the Bay is honoring her at the annual dinner on May 17 this year. The shark-fin sales ban campaign Meeting with state Sen. Ted Lieu with Sue Chen, Yue Rong, Guangyu Wang, Donna Chen and our own Sarah Sikich. We got nowhere and Sue Chen of Shark Savers was so peeved about giving away her two favorite shark puppets (Tiger and Hammerhead) to Lieu for his children. Reading my brother Jonathan’s op-ed, one of the best pieces he’s ever written. Watching in awe the work of Jennifer Fearing and the Humane Society. The joy of getting the call when the bill was signed last year. Starstruck An event at a Santa Monica bar where rock Hall of Famers John Densmore and Ray Manzarek from the Doors made a generous donation, and The Surfers (Kelly Slater, Peter King and Rob Machado) played in front of an enthusiastic crowd including Pamela Anderson. My dissertation research on pathogens in stormdrain runoff and the fate and transport of runoff plumes on the beach. 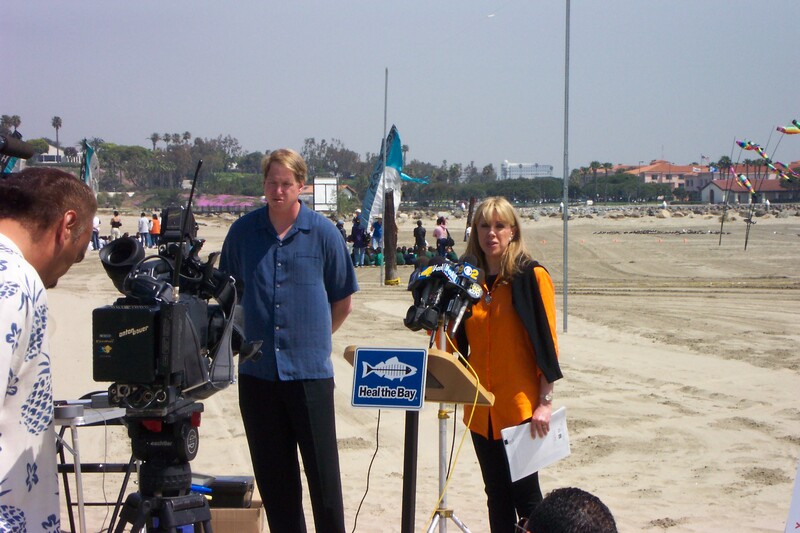 It never would have been possible without dozens of volunteers collecting samples during all sorts of conditions, support from the Santa Monica Bay Restoration Project, and the analytical efforts of L.A.’s Environmental Monitoring Division, and virologist Charlie McGee and his crew at the Los Angeles and Orange County Sanitation Districts. The research demonstrated that human sewage was getting into stormdrains, which led to the first-ever epidemiology study on swimmers in runoff contaminated waters. The study demonstrated that people that swim at runoff polluted beaches were far more likely to get sick. These results were the catalyst for AB 411, a state bill that established California beach water quality standards and a beach monitoring and reporting program.